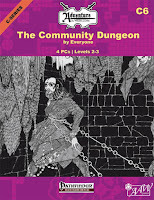 The Community Dungeon by AAW Games/Adventureaweek.com is now available for purchase. I authored a few rooms and created a few new monsters for this old school dungeon crawl. 88 pages of pure old school dungeon! you like to write up your own room in our first ever community dungeon?” I wanted to build an old school dungeon with likeminded folks, throwing the typical adventure building model out the window and starting from scratch with a bunch of empty rooms and only our incredible imaginations to fill the gap. What started off as a simple idea turned into a very complicated process which I can only describe as “herding cats”. However, almost two years later here we are! 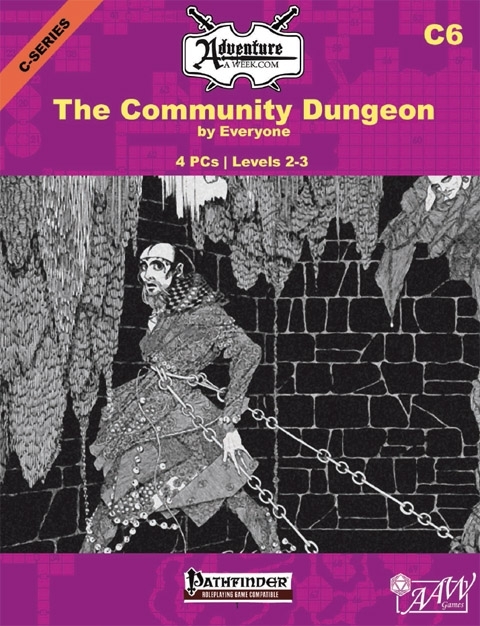 Our first community dungeon adventure is done and with it the chance to do another. If you love this adventure please share your thoughts with us! Post on our forum at AdventureAWeek.com, send us email, go outside and scream about us to the sky and moon. If you the reader, the GM, the old school dungeon lover wants more we would be more than happy to oblige...and if you want to be a part of the next dungeon... well you better get your manuscript ready, it will be here before you know it! In ages past, a dungeon was created. Designers, engineers, and trapmakers from every land were brought together to create this insidious vault. Is it a temple to some unknown and forgotten god? The keep of a mad warlord? The crypt of a necromancer? A test to see which adventures can pass and return with pockets full of treasure and which fail and are never see again? The only way to find out is to enter and see if you survive.